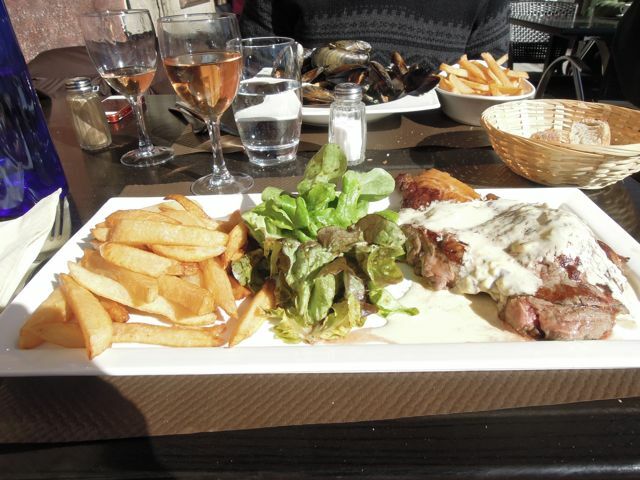 I will confess, that the Café du Cours is one of our favourite lunch spots. I've been reluctant to include it in TFIL on that basis - are we biased? I suppose we are - biased because the food is great, the staff are friendly, and it's in a lovely spot looking over the square in Reillane? Trying to stay objective anyway, here's how our lunch went. We were meant to go to Forcalquier, but the LSH was busy with work, so we needed to stay local. Ok, Café du Cours it is, we agreed. We ambled up and sat down on the terrace in the sun, and quickly took our coats off. Oh yes. 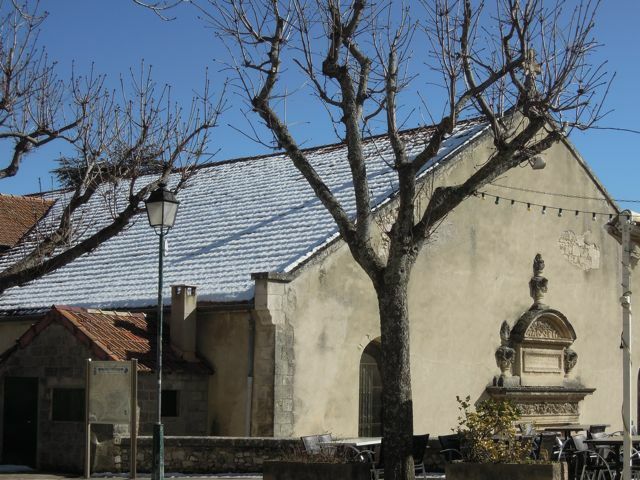 It was like a summer's day, except for the snow on the roof of the church beside us. 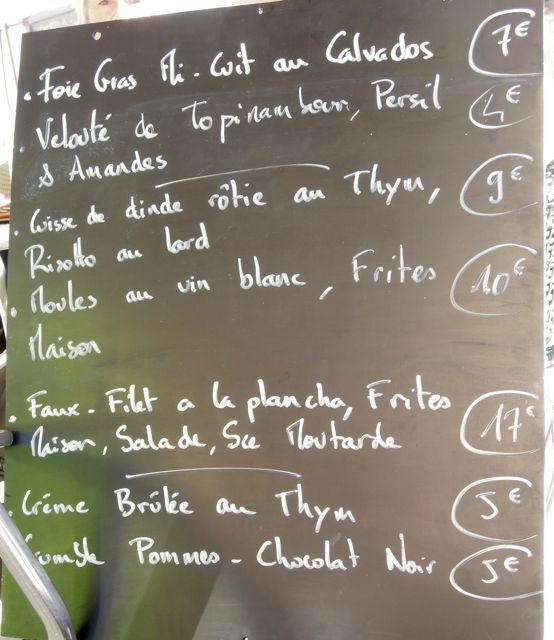 They don't do a menu du jour, as such, but they change their menu regularly. For starters, I ordered the Foie Gras, and the LSH ordered the Velouté de Topinambour. 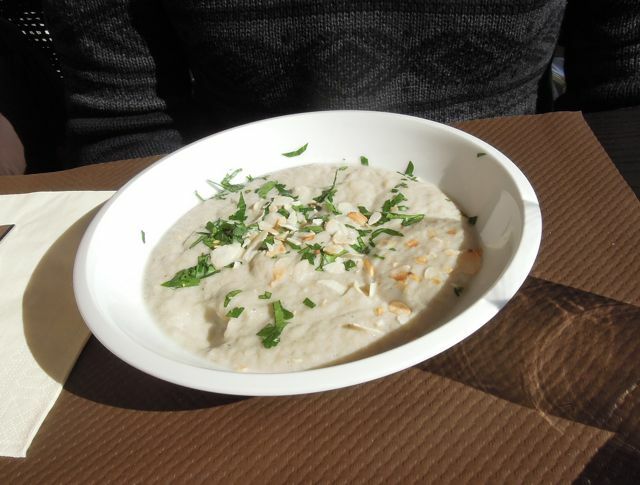 Neither of us had a clue what that was, and when it arrived, it looked like a bowl of porridge. 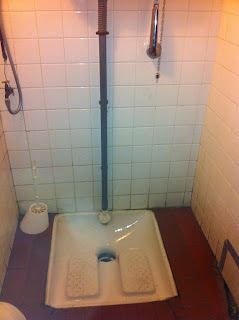 Ever curious, I asked what it was. The chef told us that it was a vegetable that was used as a substitute for potato in the war, and then brought one out to show it to us - AH! Jerusalem Artichoke! I've never cooked it, and I don't think we've ever eaten it before, but it was nice, I'd have it again. Rumour has it that it has some unpleasant effects on the digestive system - I can categorically state that these rumours are not unfounded. I ordered the Foie Gras Mi-cuit au Calvados... yum. Sorry animal rights people, I love Foie Gras. For our main courses, well there were Moules et Frites on the menu, the LSH's favourite, so that was a no-brainer, while I orders Faux Filet... or Faux Filly, so definitely NOT horse, then. The moules were big and juicy, the faux filet (it's sirloin) was very tasty but could have been more tender... yeah, I'm nitpicking, just trying not to be biased, y'know. For dessert, I'm watching my figure, so I had coffee, while he chomped his way through a Crème Brûlée - flavoured with thyme. OH BOY, does that work!!! WOW! I was mean and I knocked a star off for my tough steak... it would be 4.5 stars if I had a Half Star symbol. Café du Cours is a very traditional French Café. It's been there for years and years - in fact we saw a photo of the exterior which had been taken in the 1920s, and if you changed the faces and the clothes, it could have been taken yesterday. 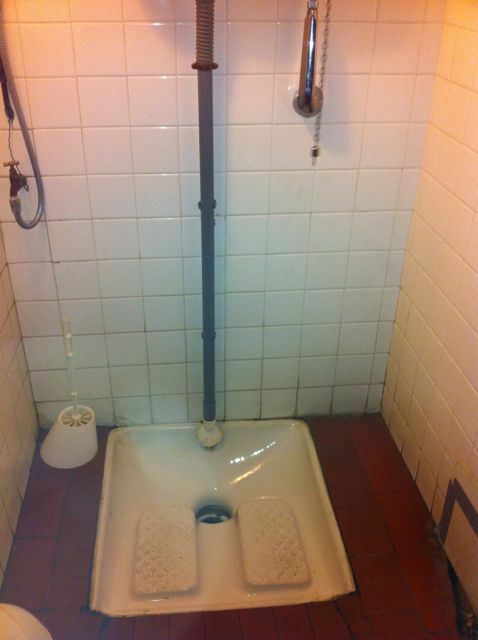 make sure you go to the loo before you visit. Or else cross your legs. It's worth the pain. I'm not sure I'm as adventurous as you when it comes to eating. I'd never order something in another language that I didn't know what it was before it came out. I guess if you understand the language you can sort of figure it out. Everything looks good. Glad you had a nice lunch. 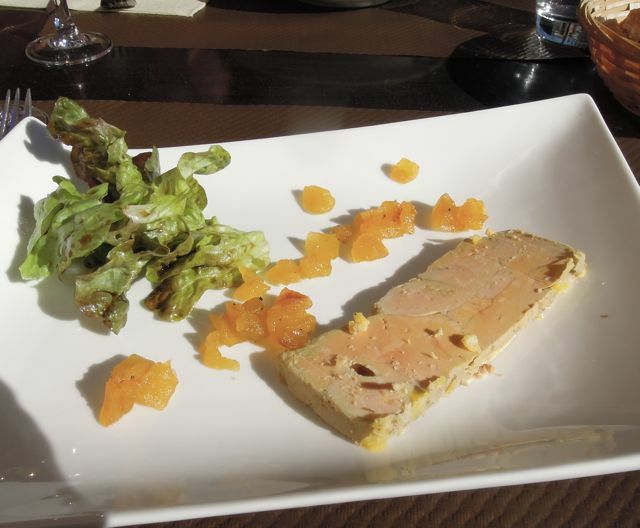 I love foie gras too. It's banned in California now, so depressing. 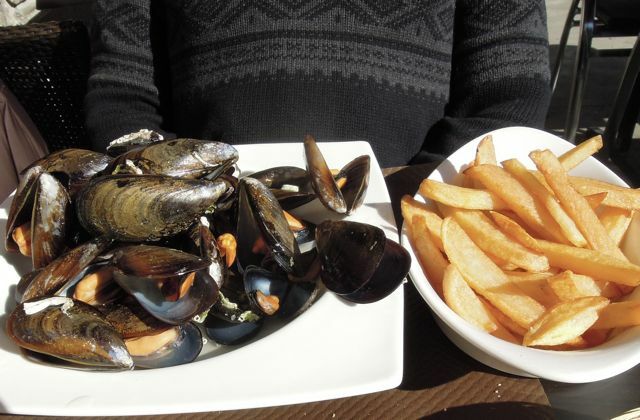 Moules frites is one of my favorites too. I think I would love that resto too.